Longboat Key is one of quietest barrier islands on the Gulf Coast, chiefly ignored by the spring break crowd, and happily missing the glitz that characterizes other Florida beach towns. Numerous young professionals and retirees head to the pristine but less populated beaches taking advantage of the premier golf, tennis, and luxurious facilities, along with the various Sarasota real estate opportunities dotting its 12-mile beachfront. Residents are also mere minutes from St. Armands Circle and Sarasota, allowing effortless access to around 130 diverse shops, restaurants, and assorted entertainment. Condominiums are a popular option for those residing full time or spending winters in Sarasota and condos for sale on Longboat Key satisfy the tastes of almost everyone. With its fresh gulf breezes and warm tropical waters, Longboat Key brings potential residents a beautiful blend of relaxing in the sun with numerous fun and exciting things to do. Longboat Key features a wealth of wildlife and its waters teem with dolphins, manatees, and other indigenous fish species. Golf and tennis lovers enjoy upscale facilities and those seeking a simple relaxing afternoon will find that in numerous park areas. Located at 1900 Harborside Dr, the Fairway Bay condos for sale were designed and built starting in 1982 and completed around 1988. This incredible development features 286 Mediterranean inspired condos highlighted by airy and spacious townhouses along with four, five-story structures housing the other residences. Each features a private garage, high ceilings, and windows with terraces facing the meticulously manicured landscaping. The amenity list is extensive with Fairway Bay’s access to the 27 holes of golf, tennis facilities, and marina located at the Longboat Key Club. In addition there is a clubhouse, fitness center, hot tub, spa, 2 resort style pools, and miles of meandering paths where unhurried bike rides or peaceful strolls are shared. The condos for sale at Fairway Bay feature floor plan sizes from 1,192 to 2,632 square feet and are typically configured from 2 bedroom and 2 baths to 3 bedroom and 3 baths. These spacious, airy, and bright residences carry price points ranging from around $500,000 to just over $1 million. 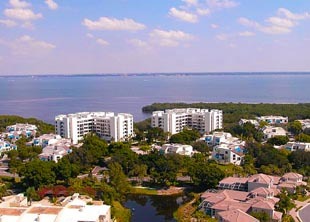 Fairway Bay has residences to fit just about everyone’s needs. Because of the spectacular water vistas afforded through oversized windows, residents of Fairway Bay can relax in the natural grandeur of the Longboat Key island paradise. So if that burning desire to live on the beach and strolling beaches has reached its boiling point, its time to investigate “The Keys”. Instead of fighting the winter cold you could be walking the beach, picking up shells, and watching gorgeous evening sunsets.